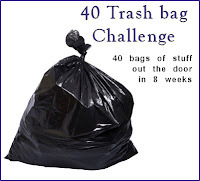 I can't believe that it has been a month since we started the 40 Bags in 40 Days Challenge! (I started early so that we could be finished before Holy Week.) We actually have been able to make better progress than I thought we would and, after the 2 bags I filled in the kitchen this afternoon, we are already up to 35 bags (including trash)! To make it a bit more challenging I am considering not counting the 5 bags of trash and try to fill another 10 bags, instead of five. It's getting harder, but is so refreshing to let go of some of this "stuff" that I've hung on to for way too long. So, how is the 40 Bag Challenge going for you? Lent activities have been slow to start this year. We found out we will be having a baby in October and we are so excited. This puts me at almost 10 weeks along and just now feeling a little better. I also forgot that trash is included in the 40 bags. God Bless Jessica. Congratulations Pamela! That is wonderful news! Did I miss something? Never counted trash bags, however, I sense this project can be designed in many ways. For me, I considered and counted only bags of near to new items donated to Good Will and Salvation army and the food shelfs (food)...It really felt great and I am now at 42 bags. 22 of those were 13 gallon stretchy bags filled to the brim and 20 were grocery bags filled to their bursting seams...with clean washed folded clothing, so thank you so so much for the inspiration of this entire wonderful Lenten project! I would like to think many will be blessed with the results.. You are amazing Jessica! God bless! I love this! 40 bags in 40 days!!! We will be doing this too! It's been slow progress here. We can do it! Even my boys went through their beloved missing wheels, beat-up, much loved car's bin to donate to "Good boys and girls" as they put it. Yes, there are many ways in which you can customize this challenge for your own family. Anonymous ~ My "trash" bags are bags of stuff that are not in decent enough shape to donate. I was counting them towards my total at first, since it is still stuff I have hung on to and am now getting out of our home, but think I may be able to complete the challenge without them. It's going to be hard though. Good job on filling 42 bags!!!! That is wonderful! Megan ~ That is so sweet! It sounds like you are off to a great start! Not so good over here. Its not for the lack of wanting to do it. But, I have had alomst NO TIME to go through each room. We are at 6 bags to donate and 3 bags of trash. We are making a big effort to go through the learning room and the games this weekend. So hopefully I'll have a better "report card" before lent if over. I am half-way to 40. As I go through the rooms I am really going to have to get ruthless to meet the goal of 40 bags. We have a small house and with 8 people much of the "clutter" is necessary items... shoes and toys for people of different ages and genders, homeschooling supplies for four students... It is a little frustrating to realize that much of what drives me crazy must stay! But what I have gotten rid of so far has made a definite improvement! Hey, I've almost bought one of those latches puzzles, does it not work well or something? Mel ~ The puzzles are well made (though some of the latches can be really hard to get open) and a great idea, which is why I've hung onto them for so long, but they take up so much space (especially since they don't stack well) and my children have never really spent much time playing with them. I moved them to one of the narrow new shelves in my school room thinking that they would now get used a little more often, and still there wasn't much interest. Funny thing is, when they were sitting by the front door today, ready to go, Snuggles started playing with them!! I ended up giving them to my mom, who said she'd keep them for when he comes over. They will probably get used more at her house than they have ever been used here! lol! HI Jessica - I know this is not in the right place, but can't see another spot to ask a question!! I love your wooden doll saints and would love to paint some with my children. Where do you buy them and what size are they? Thanks for sharing your life and all your inspirational ideas!! Ok, your're house (what I can see in posts) always looks very tidy. where are you finding all this stuff to donate? I thought you just did a cleaning before the school year began. I had some similiar puzzles and I ended up giving them to my doctor for use in the waiting room. Just an idea. "When did I (or the kids) last use this item?" "Is it something I use regularly and, if not, is it something I love?" "Is it worth the time I invest in cleaning or storing it?"